(Nanowerk News) Polishing metal surfaces is a demanding but monotonous task, and it is difficult to find qualified young specialists. Polishing machines do not represent an adequate alternative because they cannot get to difficult parts of the surface. A new solution is provided by laser polishers. Metal mold for glass manufacture: the lower part of the mold has been left unprocessed, the upper part has been laser-polished. 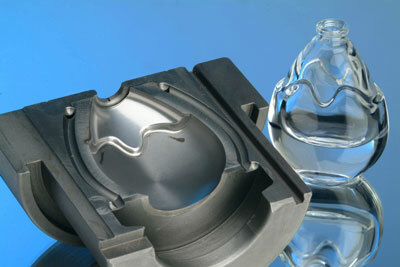 On the right, the product that can be made using a mold of this type. Jobs are in short supply, and yet some sectors have difficulty in finding suitable trainees for specialist tasks, such as polishing injection molds. The work is time-consuming and monotonous but requires highest levels of concentration, because any blemish in the mold can render it useless. A skilled worker may often need a whole week to polish a single metal mold. Up to now it has not been possible to use machines for this dreary work because they cannot get into the curved shapes. Researchers at the Fraunhofer Institute for Laser Technology ILT in Aachen have developed a way of automating the polishing work: “We do not polish the surface by hand with grinding and polishing media. Instead we use a laser,” explains Dr.-Ing. Edgar Willenborg, group leader at the ILT. “The laser beam melts the surface to a depth of about 50 to 100 micrometers. Surface tension ensures that the liquid metal flows evenly and solidifies smoothly.” Like in conventional grinding and polishing, the process is repeated with increasing degrees of fineness. In the first stage the researchers melt the surface to a depth of about 100 micrometers, in further steps they gradually reduce the depth. “We can set the melting depth by means of various parameters: the laser output, the speed at which the laser beam travels along the surface and the length of the laser pulses,” states Willenborg. Laser polishing does not achieve the same surface smoothness as perfect hand polishing – hand polishers can achieve a roughness Ra of 5 nanometers, the laser at present can only manage 50 nanometers – but Willenborg still sees considerable market potential for the system. “We will concentrate on automating the medium grades: a roughness of 50 nanometers is adequate for many applications, including the molds used for making standard plastic parts.” The high-end levels of smoothness will therefore remain the domain of skilled hand polishers. The time gained by laser polishing and the cost saving achieved are enormous. Whereas a skilled polisher needs about 10 to 30 minutes for each square centimeter, the laser polishes the same area in about a minute. A prototype of the laser polishing machine developed by the scientists in cooperation with mechanical engineering firm Maschinenfabrik Arnold has already been built. Willenborg estimates that the system will be ready for industrial use in one to two years’ time. At the Euromold trade show, to be held from December 2 to 5 in Frankfurt, the researchers will be presenting examples of three-dimensional surfaces polished by laser (Hall 8, Stand M114).